This Beany Burgers recipe is a great lunch idea. The kids and everyone else are sure to love it! Always looking for a great idea for lunch, especially on a Saturday when the kids are home from school? 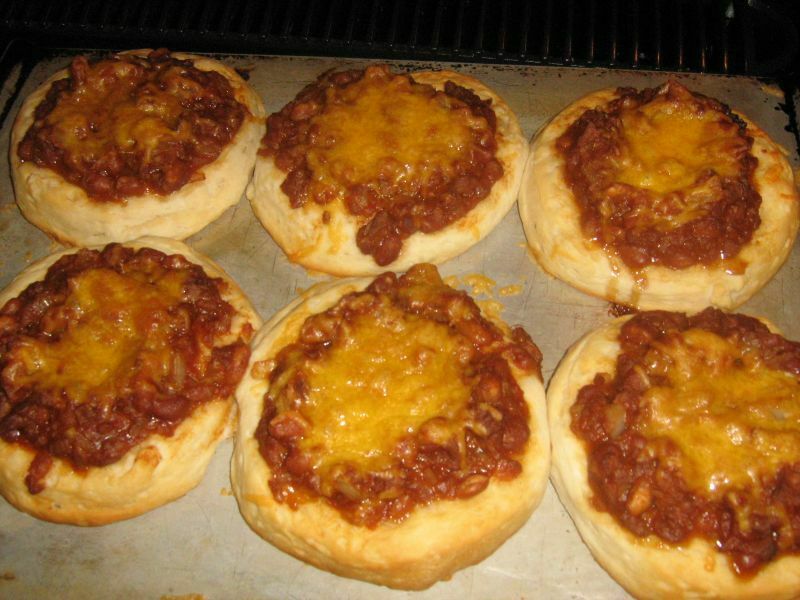 Beany Burgers on Biscuits - Sure, why not try this delicious variation...an open-faced beany burger served on a hot biscuit. These sandwiches will please the lunch bunch to be sure! We use Morningstar Farms Veggie Crumbles in our beany burger recipe. Of course you can use your favorite. We like Morningstar Farms Veggie Crumbles. They provide about 10 grams pf protein per 1/2 cup serving. Along with that they provide a small amount of fiber as well as about 100 mg of potassium with only about 20 fat calories. Cut in the shortening, mixing til the dough resembles coarse crumbs. Slowly, stir in soymilk until the dough mixture pulls away from the bowl, adding a little more flour as needed. Place dough on a floured surface and knead the dough for several minutes. Do not over-work it, just blend it well. Pat dough to about a one inch thickness, and cut dough using a biscuit cutter or a floured glass. Place on lightly greased or sprayed baking sheet and bake for about 12 minutes or until beginning to turn a light, golden brown. While the biscuits are baking prepare the beany burgers. In a medium skillet heat a tablespoon of olive oil. Add in the veggie crumbles and onion and begin to "brown" them. Add in the salt and cumin and stir well. Cook another 2 or 3 minutes. Add the remaining ingredients - mustard, ketchup and baked beans, and allow to cook to heat through. As the biscuits finish baking, remove them from the oven, spoon about 1/3 cup of the beany burger mixture onto each biscuit, top with vegan cheese and return to the oven for about 5 more minutes or until cheese melts and biscuits are nicely browned. Plate the biscuits and serve with steamed broccoli and apple slices.